After the 2010 World Cup, English football seemed to have finally moved on from the 4-4-2. Alf Ramsey had beenÂ revolutionary in his adoption of the formation for England’s most glorious moment, but it became gradually more and more outdated over the following 44 years -Â to the point where even the lowest of tabloid journalists, who a season or two before had been calling any (foreign) manager straying from two banks of four ultra defensive, were lambasting the shape of Fabio Capello’s England side after they crashed out of the tournament in South Africa. With some of the world’s most successful teams lining up without any strikers at all, there was suddenlyÂ a widespread agreement thatÂ twoÂ was a bit much. Just as England seems ready toÂ open up to new ideas, Manchester United pull miles ahead in the Premier League, playing in, of course, a 4-4-2. For a mass shift that took decades to happen, United have done a good job of immediately making any fuss seem silly. Nevertheless, it wouldn’t matter if it wasn’t working, so why exactly have they been able to revert back to a shape that was being easily outmanoeuvred a few years before? There are certain stock responses that can be used for any shifts in shape – that football is cyclical or that formations aren’t a game of rock, paper, scissors where X beats Y and any formation can be used providing you have the players – but there are specific characteristics of formations that lend themselves to certain ways of playing, and it’s these that are the more noteworthy trends. So how does Manchester United’s 4-4-2 measure up? There was an element of moneyball to United’s workings. Football’s emphasis in recent years has been on midfield – an area where United have been notably lacking – but, given the top sides have monopolised most of the best midfielders, a change of tact may have been necessary rather than simply investing in the best of the rest. 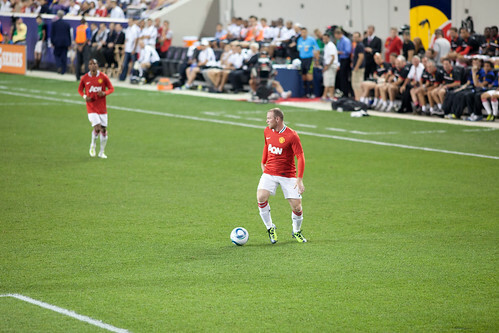 As other teams were looking to emulate Barcelona by copying their style with lesser players, United were trying to maximise the areas that Barcelona neglected – bringing in Robin van Persie despite already having a wide range of strikers at the club, including their best player Wayne Rooney. If Europe’s best beat the rest without strikers and everyone followed heir example, United could buy up the best forwards and use that quality to come out on top. Where this argument falls down however is that it suggests United were something they weren’t. Unlike Freiburg, United were not playing a wildly different game from the teams around them. It may have been a rough 4-4-2 shape, but it didn’t have the directness associated with the formation. Wayne Rooney would frequently drop deep and create closer to the midfield, leaving Van Persie playing in a role not much different from the one he had been playing in before as a lone striker for Arsenal, while they no longer bothered with the great United tradition of wingers, relegating Ashley Young and Nani to the bench and frequently replacing them with Shinji Kagawa and Danny Welbeck. They had actually shown a better example of direct football in a 4-4-2 the year before, only to give up when they got mauled 6-1 by Man City and recall Paul Scholes from retirement. Not only could you doubt United’s 4-4-2 credentials but you could question whether or not they were a success. Another Premier League title is an obvious success, yet it is ultimately relative. Although unlucky against Real Madrid, United didn’t make much of a mark in Europe and notably switched their gameplan for their big games against Jose Mourinho’s men. They also frequently came up short in the season’s big domestic games, which begs the question of whether despite their trophy United were actually particularly good. Although Michael Carrick had the best season of his United career and several others were solid, the overall play was often left wanting, especially with previous star man Rooney looking increasingly disinterested and an inability to settle on a defence. The exception to this was Van Persie, who was happy leading the line even when occasionally only feeding off scraps. It’s not unfair to suggest that which side of Manchester the title landed on depended on who Van Persie chose: in a similar vein to AC Milan’s 2011 scudetto win, United’s league title didn’t necessarily hinge on being the best team but on an ability to beat the worst (who made up quite a considerable chunk of the league this year, with every team in the bottom half still facing the possibility of relegation with two games left to go). What separated United when grinding out wins at smaller clubs was that Van Persie was able to make far better use of whatever chances he was given than those at their counterparts, and David Moyes will surely be looking at every knee brace, helmet and horse placenta to make sure he’s able to do the same this coming season. The most likely answer is no – Manchester United’s success will not repopularise 4-4-2. They played in a shape that only just resembled a 4-4-2 and they didn’t even do it particularly well. The likes of Swansea had a more distinct and obviously successful model to follow in Barcelona; the move to a packed midfield came with an increasing focus on possession football. A movement back to a standardised 4-4-2 was unlikely to come from Man United when they were still playing the slower paced style only with an extra attacker – they were just like Spain at Euro 2008, who chose to play both David Villa and Fernando Torres in the same line-up because they couldn’t pick between the two. What is perhaps more notable is Bayern Munich’s success. Although they have mimicked Barcelona’s style, they have supplanted the Spanish champions as Europe’s best by increasing the physicality of the Tiki-Taka gameplan. Barcelona frequently were able to avoid physical contests by passing around the opposition, but Bayern don’t have to and are better for it. This extra physicality is generally more associated with direct football though, and Borussia Dortmund (plus Marcelo Bielsa’s popular Athletic Bilbao before them) showed that more vertical styles can be successful too. Barcelona’s rise came from passing football, but also through a belief that everyone should be able to attack and defend. It is perhaps this trend that will last longer, as the likes of Jurgen Klopp followed Arrigo Sacchi’s ideals but used them in quicker, direct styles. In Barcelona’s more considered style it was about maximising the potential of creating the best chance they could, although in Dortmund’s case it may be more about maximising the potential number of chances. We are also starting to see a backlash against the possession-first tactic, as Spain’s games increasingly begin to resemble that episode of The Simpsons and how entertaining they are is brought into question. Boring football isn’t bad football, but the Barcelona team that surrendered La Liga to Real Madrid in Pep Guardiola’s final year was far more passive than his first side and worse because of it – Lionel Messi dropping deeper and deeper into midfield, Barcelona were left with only Alexis Sanchez’s diagonal runs as a forward outlet and frequently lacked attacking focus – while Spain’s Euro 2012 run was far less convincing than the one four years before, treating possession as an achievement rather than a means to a victory until an impressive final. United may not bring 4-4-2 back, but football’s moving in a way that suggests the direct football it is suited to will be back sooner rather than later.